Why I settled on the Sony α NEX-5 as the best mirrorless interchangeable lens camera for myself. These are exciting times for DSLR enthusiasts. We’ve all marvelled at the creative and operational flexibility afforded by the large dial, switch and button infested DSLR bodies and interchangeable purpose-built lenses. We’ve been spoiled for the impeccable image quality afforded by the 8.5-15x larger APS-C sensors (upto 34x larger if you’re a 35mm shooter). It’s impossible to look back at compacts. Or is it? Most DSLR shooters sooner or later realise that their beloved hunk can’t be their only camera. They can’t carry it all the time to family events. They can’t do anything about it if they happened to dine in a fancy restaurant on impulse. Carrying a DSLR has to be planned ahead, owing to its bulk. In the last couple of years, though, the B-level interchangeable lens system manufacturers (anyone other than Canon and Sony) had been pushing the boundaries of how small an interchangeable-lens system could be made. While I’ve followed this category (dubbed EVIL — Electronic Viewfinder, Interchangeable Lens), it’s right about now that I have finally settled on a system. It’s going to be none but the Sony α NEX-5 for me. If you follow me on twitter, you’d already know about this. Here’s a brief overview of stuff that I considered and what sold me on NEX-5. These are essentially non-interchangeable zoom compacts with puny sensors. Canon G10, G11 and the latest, G12, are leaders in this category, owing to their small size and controls that are suited to DSLR users. Heck, they have an ISO selection dial! Some people also choose the smaller Canon S90/S95 systems. Their undoing, however, is their image quality. While they’re considerably good in terms of IQ, sensor technology has been favouring large and small sensors equally and large sensor systems have leaped further ahead in terms of dynamic range and low-light capabilities. Nikon’s recent offering, the P7000, is a worthy addition to this lineup. It trumps the G12 in terms of specifications though deeper IQ analysis is pending. Certainly, though, these systems aren’t going to offer the kind of IQ one gets from today’s DSLRs. Written off. Panasonic Lumix GF-1 and Olympus PEN EP-1, however, put the same sensor in rangefinder/EV bodies that were significantly smaller. What’s remarkable about them is that they are about the same size as the Luxury Compacts if you put a pancake prime lens on them. Yet, they offer visibly better IQ and flexibility to change lenses. GF-1 and EP-1 were instant hits with shooters of even Nikon and Canon DSLRs as they afforded DSLR-like IQ and operations, without the bulk. Around this time, people started speculating about Nikon and Canon jumping into the Mirrorless Interchangeable Lens (MIL) segment as well. This May, Sony announced two APS-C MIL cameras — α NEX-5 and α NEX-3. For the purpose of this post, I’m going to ignore NEX-3, which is just a cheaper version of NEX-5 designed to win price wars where needed. What’s cool about NEX-5? Well, consider that despite being an all-metal body, it’s considerably lighter than anything in this category. Not only that, it’s also the smallest. It’s smaller and lighter than the Canon G10/11/12, it’s smaller and lighter than Nikon P7000, it’s smaller and lighter than Lumix GF-1, than PEN EP-1 or EP-2… heck, it’s smaller and lighter than anything at all! Tilt-up/-down LCD screen with best-in-class display. Hand-held HDR creation with upto 6-stop difference among bracketed shots. It works. Multiple-shot High ISO blending for reduced noise low-light photography of still subjects. 3-function programmable jog dial and 1-function programmable lower soft-button (firmware v3). 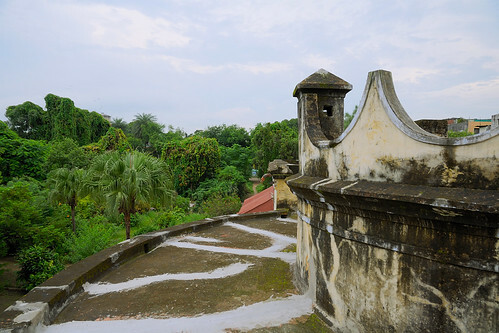 High-resolution 2D/3D sweep panoramas. It’s not magical, but it does usually work. A pan-head tripod like the <a href=”http://www.flickr.com/photos/code_martial/3757510707/”>Sony VCT R640</a> that I have will be of tremendous help. 1080p/24 fps videos with continuous AF (Nikon D3100 is the first to offer continuous video-AF in DSLR form-factor). No wonder then, that the Sony α NEX-5 is the best mirrorless camera available. In the absence of any significant moves from Canon or Nikon and Sony’s continued ground-breaking advancement into compact APS-C bodies, NEX-5 is also likely to hold its position this year. Author Tahir HashmiPosted on September 22, 2010 August 26, 2016 Categories GearTags alpha, camera, compact, e-mount, evil, mil, mirrorless, nex, nex-5, sony2 Comments on Which Compact Interchangeable-Lens Camera? On my recent vacation, I took a bunch of bracketed exposures to turn into HDRs. Before this trip I only used a tripod for bracketing. This time around, however, I had to deal with hand-held bracketed shots. To make things a bit worse, these shots included foliage, which isn’t always stationary between shots. Picturenaut utterly failed to align these images. I tried Luminance HDR (qtpfsgui) for Windows 7 (64-bit), and it simply kept crashing. Then I tried Hugin, which too failed to do much. Besides, it was extremely confusing since it is a tool for stitching panoramas, with HDR and alignment being a part of the whole. Finally, I found HDR Alignment Tool — a free Windows utility for aligning multiple images using manually selected control points. Following is a screenshot of what the tool looks like. There’s a selection of input files at the top, and the output preview in the bottom right corner. The “In”, “Out”, “1:1” and “Fit” buttons are zoom settings for either the source images all together, or for the output preview. “CP1” and “CP2” refer to the control points and allow centering on the chosen control point. The default selection of control point locations and the resulting alignment aren’t great, so just relocate each of them manually and fine-tune the alignment by visually inspecting the sharpness of the output image near the chosen control point. It’s cumbersome, but it works pretty well. The tool also includes some lens correction features but I didn’t use them, instead making Capture NX2 apply lens correction while creating the source JPEGs. Oh, let me now get to the workflow, which is a bit involved since HDR Alignment Tool doesn’t work with TIFF or RAW files. Load each bracketed exposure in Capture NX2. Ensure that all exposure parameters (white-balance, etc.) are the same, apply any other pre-processing steps (lens distortion correction, in my case) and create JPEGs. 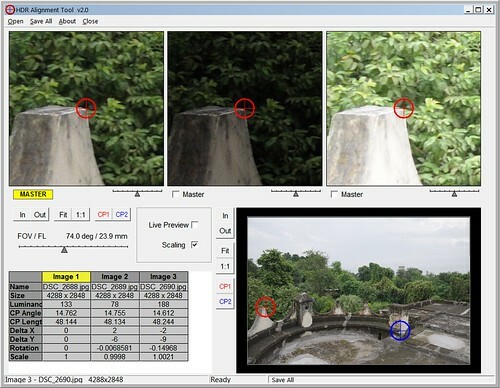 Open the JPEGs in HDR Alignment Tool, carry out the alignments and save the aligned JPEGs. By default, the tool will append “Aligned” as a suffix to the file name for distinction. Open the “*Aligned.JPG” files in Picturenaut. Apply the desired Tonemapping. Save the tonemapped output as a 16-bit TIFF. Load the TIFF back in Capture NX2, apply post-processing (tilt, sharpening, colour adjustments, etc.) and finally save the HDR JPEG.